Over the past half-century, a few staple foods like rice and soybeans have come to dominate people's diets all over the world. And this could spell disaster. A new research paper published in Proceedings of the National Academy of Sciences explores how local staple crops like cereals and roots have been superseded by "energy-dense foods" like palm oil. "Wheat is a major staple in 97.4 percent of countries and rice in 90.8 percent; soybean has become significant to 74.3 percent of countries," the researchers say in a release about the study. Not only does this mean our diets are less diverse, and less healthy, but it could mean famines are on the horizons. The problem is that when the world depends on a few staple crops for nourishment, the health of those crops are synonymous with world food security. And if there is a drought, or pests, we're more vulnerable to famines if we're only growing one or two kinds of staple crops. It would essentially be like the Irish potato famine writ large. One plant disease could take out the world's soybean supply, just the way a potato disease robbed Ireland of its export crops and food supply in the mid-nineteenth century. Another danger of a more homogeneous global food basket is that it makes agriculture more vulnerable to major threats like drought, insect pests and diseases, which are likely to become worse in many parts of the world as a result of climate change. 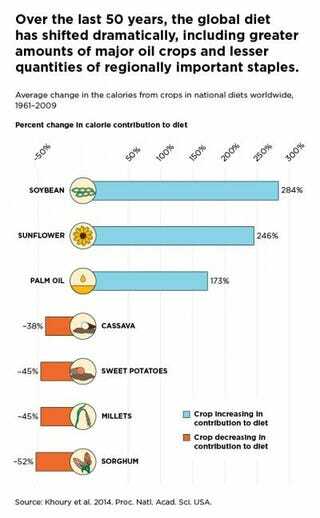 As the global population rises and the pressure increases on our global food system, so does our dependence on the global crops and production systems that feed us. The price of failure of any of these crops will become very high.